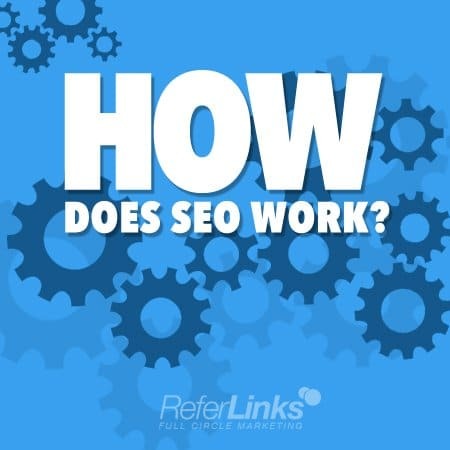 How Does SEO Work and Why do Results Differ on Websites? SEO refers to strategies and tactics you can use to increase the number of visitors to your website by ranking well in the search results page of a search engine. The “Big Three” search engines which are used most often are Google, Yahoo! and Bing. Most people who are looking for information online are not likely to click through several pages of search results to find the information they are looking for. The higher your website ranks in organic (unpaid) listings, the more likely it is to be clicked on by a site visitor. A number of people create a new website, a blog, or a post and wonder why they can’t find it on Google right away. The reason is that the search engine hasn’t indexed it yet. New websites don’t have any authority on the World Wide Web; they are so new that no one has any information about them, and that includes Google. If you want search engines to know about your website, you would have to submit it to each one or wait for their crawlers to find it. Crawlers (or spiders) are specialized software that feed pages to search engines. As soon as they find a link to another page, the crawler fetches it. Eventually, your website will be added to the search engine’s index of sites, but it can take some time. Your search engine ranking will vary, depending on a number of factors. One of them is the keywords you decide to use on your site. If you are using keywords that are very popular with other site owners, you will find it more difficult to rank highly than if you choose keywords that have less competition. It’s much easier to be a big fish in a little SEO pond than a little fish in a big one when it comes to competing with multiple sites over the same keyword phrase. If you aren’t seeing the results you would like from your SEO efforts and you aren’t happy with your website page rank and the resulting level of traffic you are getting, there are some things you can do. Blogging is an effective way to boost your page rank by posting fresh content on a regular basis. By updating your blog regularly, you give search engine crawlers new pages to index. You will also have the chance to rank for different search terms through different blog post topics, which will give potential buyers even more opportunities to find your business online. Link building works with your SEO to maintain and improve your website’s rank. It creates connections with individuals and other websites which are considered authorities in your industry. These links build high-quality link backs to your website, which helps to improve your site’s credibility, and your rank with search engines. Pay-Per-Click (PPC) is paid advertising that places your company’s ad directly in front of customers who are searching for a keyword on Google or other search engines. This strategy allows you to rank for keywords that your site may not be indexed (and ranking) for right away. PPC from ReferLinks can be set up to suit your budget and will provide a satisfactory return on your investment. Since each website is unique, you need to take a customized approach to your SEO strategy helping Internet users find you online. Contact ReferLinks to help you find the right approach for your business. Please refer to additional services that ReferLinks offers that are great in addition to SEO like Link Building, PPC and Blogging. Please include hyperlinks to pages that provide supporting info about these services. This entry was posted in SEO and tagged Blogging Ontario,Blogging Toronto,Marketing Ontario,Marketing Toronto,Online Marketing Ontario,Online Marketing Toronto,Pay Per Click Ontario,Pay Per Click Toronto,SEO Ontario,SEO Toronto,Social Media Marketing Ontario,Social Media Marketing Toronto,Social Media Ontario,Social Media Toronto,Website Ontario,Websites Toronto on July 22, 2014 by ReferLinks Online Marketing.